As the sun sets over this wonderful walled city, you'll swap sandals and sightseeing for swish cocktails and secret bars. The atmopsheric town of Dubrovnik springs to life in the evening, when tourists throng terraces, cliff-face bars and lively beach lounges. If you're on a couples holiday, you'll find a few romantic bars dotted around the city including Buza II and D'Vino, or if you're planning a few drinks with friends, the Banje Beach Restaurant, Lounge & Club is a chic and fashionable venue with reasonable prices. If you want to continue the party, Revelin is a vivacious nightclub perched on top of an old fortress with a cosy terrace bar offering views of the sea. When you're not drinking cocktails or dancing on the beach, Dubrovnik is one of the best diving locations to explore thanks to its Adriatic Coastline - so you can bat away that "morning after the night before" feeling with a spot of fresh sea air and and a dip in the twinkling waters. Located on Stipanksa beach on the Marinkovac Island opposite Hvar Town, Carpe Diem Beach Club is one of the most exclusive party venues in the world - you even need a boat to get there. This stylish bar is laced with day beds, giant cushions and overized umbrellas with a first-class seafood menu to satisfy peckish partygoers before the sun sets. Famous DJs including Pete Tong and Roger Sanchez turn this high-end hangout during the day into a huge party by night, with themed-events like Motto-Parties, Black Moon Parties, Full Moon Parties and more on the menu. Hula-Hula and Kiva Bar have an equally inviting party scene. Hvar made our list as one of the top island locations in Croatia, so be sure to browse our guide and bulk out your itinerary while you're here! Split will undoubtedly leave you spoilt for choice when it comes to nightlife. Most of the action is concentrated east of the town in Diocletian's Palace and the Bacvice complex, where you're likely to find a selection of stylish cafes, restaurants and bars that are buzzing with atmopshere. If you want to spend the night within the walls of the palace, ST-Riva is a popular waterside hangout with a balcony that overlooks Riva, or head to the nearby bars of Puls, Fluid and Ghetto which are packed most evenins during the summer months. Set on the sun-kissed edge of the Adriatic Sea, the Croatian island of Zadar has a dynamic party scene. The city is steeped in history and culture, with centuries-old Roman architecture and whitewashed churches fringing the cobbled streets towards pockets of golden sand - making it the perfect place to spend a laid-back afternoon before the tempo quickens at night. A selection of tourists, students and fun-loving locals fill the cafes and spill out of popular bars including Brazil, Kult and Lotus once the sun sets, while venues such as Garden (only open during the summer months) is perfect for sophisticated drinks on the terrace. Fancy a festival? Elephant Festival, SoundWave, SunceBeat and Stop Making Sense are all worth ticking off your list. This heart-shaped peninsula on the western coast is one of Croatia's best kept secrets - and while its nigtlife isn't as thriving as some of the neighbouring islets, it's certainly a great spot for sophisticated drinks amid spectacular views. Byblos is one of the biggest nightclubs in the area with world-famous DJs and a variety of concerts to keep you entertained, while Cabahia serves up a cosy atmosphere and classy garden terrace. In the pretty harbour town of Pula you'll find Bass, a slightly more reserved cocktail bar away from the hustle and bustle of the crowds. Who said that the best places to party were down by the coast? 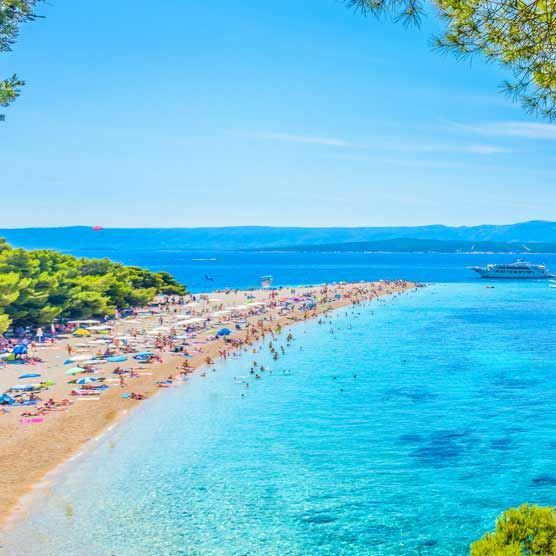 The capital of Croatia is abuzz with activity and if you want to keep up with the locals while you're here, the best nights to party are Wednesdays, Thursdays, Fridays and Saturdays. One of the most popular venues is Aquarius, a spectacular club which overlooks the Jarun Lake and regularly welcomes top international DJs - you can expect R&B and hip-hop nights from Thursday to Saturday. In summer the action shifts to Pag Islands, home to legendary fests like Electrobeach and Sonus Festival. A late entrant to the nightlife scene, Rijeka ranks just behind Zagreb for being a party magnet. Whatever be your choice, from quiet bars and busy pubs to swanky, glamourous cubs—they vie for attention in Rijeka’s town centre. Wander down its beautiful promenade in Korzo or check out the bustling waterfront - and Ii you're feeling a little adventurous, why not hop on a boat and head to Kvarner or Novajia where the party continues all night? !